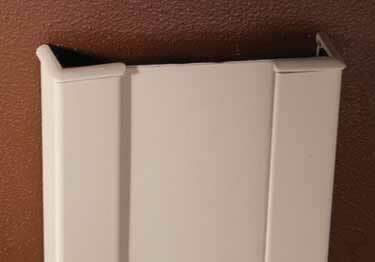 Our End Wall Guard Assembly includes two 90° corner guards with a vinyl wall covering filler strip inserted between guards for protection of wide end walls and partitions. Comes in 4', 8', 9', 10', 12' heights. Fits wall up to 9" wide vinyl filler strip can be cut with a Utility Knife to accommodate any wall thickness up to 9"
Quick ship available: ivory, tan, champagne, eggshell, silver gray, teal, linen white, and windsor blue.. Ideal for healthcare, childcare, elder care facilities, universities, casinos, offices, and warehouses providing excellent grip areas for assistance. what is used to attach the end wall protectors? Can I get a color chart for the end wall protectors? The end of wall is 8" wide, do these protectors work on this width? Yes, we will send you a color chart out. Yes, these End Wall Protectors work on wall ends up to 9" wide. A great product, easy installation, excellent service!